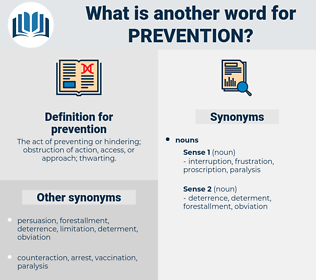 What is another word for prevention? The act of preventing or hindering; obstruction of action, access, or approach; thwarting. Preventing, countermeasures, initiatives, Measures, dangers, hazards, victims, members, MTS, preventative, protection, prohibition. precautions, interventions, principles, Recommendations, responsibilities, Organizations, practices, representatives, projects, topics, Efforts, safeguards, Risks, warnings, partners, Resources, Persons, substances, Drugs, objectives, Rights, estimates, seniors, documents, approaches, Areas, Policies, Territories, Agencies, workers, Communities, groups, causes, aspects, results, data, Males, women, initiatives, Measures. Preventing, interdiction, preparedness, protection, preventable, deterrence, prohibition. Deterred, Avoided, Cautioned, opened, Warned, blocked, suspended, Told, Denied, barred, kept, Had. 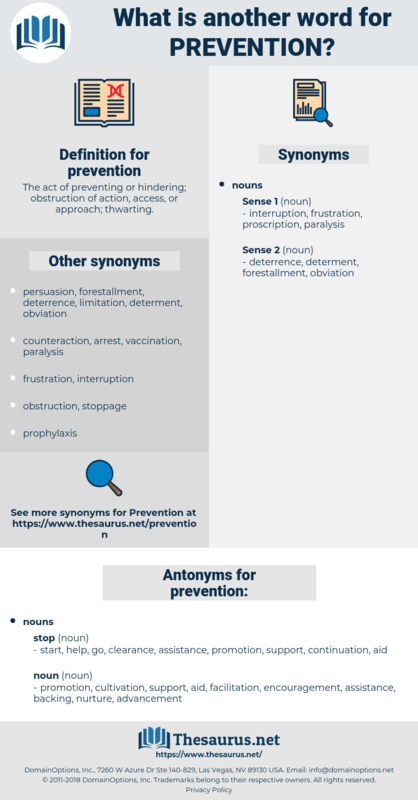 protecting, hindering, Deterring, discouraging, Precluding, Anticipating, forestalling, thwarting, alerting, curbing, forbidding, Stemming, reducing, tackling, guarding, Notifying, helping, withholding, Addressing, Checking, Suspending, telling, barring, Reversing, Maintaining, setting, Preventing, focusing, dealing. stopped, improved, encouraged, Avoided, Precluded, Provided, Forestalled, restricted, thwarted, forbidden, withheld, developed, blocked, turned, Aimed, Denied, revised, Been, barred, Refused, designed, Submitted, Allowed, kept. prohibits, Comes, asks, Has, makes. continuation, go, help, clearance, start. promotion, cultivation, support, aid, facilitation, encouragement, assistance, backing, nurture, advancement. The failure in this part of the reform of 1773 is not stated by your Committee as recommending a return to the ancient constitution of the Company, which was nearly as far as the new from containing any principle tending to the prevention or remedy of abuses, - but to point out the probable failure of any future regulations which do not apply directly to the grievance, but which may be taken up as experiments to ascertain theories of the operation of councils formed of greater or lesser numbers, or such as shall be composed of men of more or less opulence, or of interests of newer or longer standing, or concerning the distribution of power to various descriptions or professions of men, or of the election to office by one authority rather than another. I refer your Lordships to pages 2827, 2828, and 2829 of the printed Minutes, where you will find the system of his government to be formed upon a resolution not to use any one legal means of punishing corruption, or for the prevention of corruption; all that he desires is, to have an absolute arbitrary power over the servants of the Company. suppression, interception, averting, nonproliferation, prophylaxis, quelling, preclusion, crushing, non-proliferation, save, debarment, forestalling, stifling, obviation, disqualification.